Two states, three women, six kids and too much yarn. Alternate Title: Look Ma! No Seams! I began this project during the Olympic swimming week. I finished in about 5 days and discovered that although I had altered the numbers due to gauge and cast on more than it called for, I had failed to alter the numbers for where to place the sleeves. This was a big mistake (damn that Michael Phelps). I never noticed until I had cast off (damn him and his intoxicating racing). I rushed to TYL to see Brilliant Melanie, could anything be done to save it? I already knew the answer, and she could see that I just couldn't stand tearing it out. She sent me next door with the kids as she ripped and rewound for me. Aren't knitting friends the best? I reknit it in EZ's numbers since my gauge really wasn't off that much and now, she is a thing of beauty. Modifications: I am so over seams. I know that I'll have to deal with them again, but anytime that I can avoid them, I will. 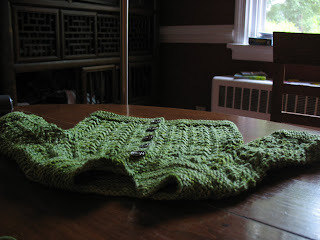 Even though this sweater doesn't have many seams, I knit the sleeves in the round to avoid sewing them up. No seams, none, nada, zippo, zilch. Also, I slipped the first stitch of each row to create a nicer edging. I toyed with the idea of crocheting a little picot edge, but decided that the plain edging was simple and beautiful. 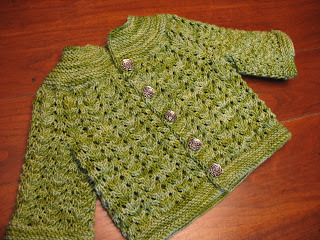 The exquisite buttons are, my favorites, from Danforth Pewter via TYL. The next few projects will also be baby things, since my friends and family evidently just can't keep their pants on. Will you people please stop procreating and let me knit myself a sweater? 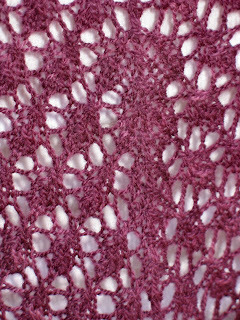 Comments: This is my second DROPS pattern, and like the first, it is a pattern that assumes some competence from the knitter, and as the knitter, you must fill in some technical details in the instructions. 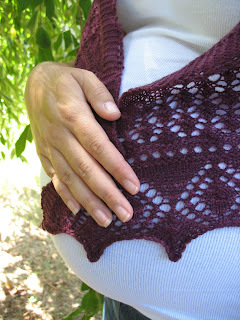 For example, when forming the scooped neckline, the instructions are for short-rows; you stop knitting in the round, and begin knitting back-and-forth, while knitting one fewer stitch on each neck edge every other row, but nowhere does it say to wrap-and-turn. Trust me when I say that your neckline will look terrible unless you wrap-and-turn. 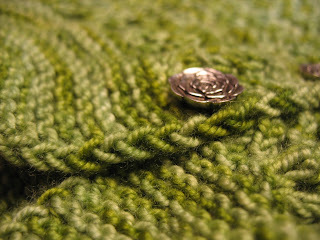 My advice for DROPS knitters is to listen to the inner knitter, and assume that they've left out some details. And wrap your short rows. I usually make sweaters with no ease or negative ease, but this sweater is meant to be blousey, and the eyelet pattern requires a camisole or tank underneath. The secret to not being overwhelmed in a top like this is for the armscyes to fit perfectly, but many of the raglan sweaters I had made in the past had way too much fabric under the arms. I am petite, with narrow shoulders, but I do have a rack, so to fit my bust measurement in many patterns, I end up with raglan seams that are way too long. My fix was to speed up the raglan decreases by decreasing every row instead of every other row as soon as I began shaping the neckline. I'm really pleased with how it worked out; it's the first time I remember being satisfied with the length of a raglan seam on any top I've knit. I ended up with a number of stitches on my needle that corresponded to nothing in the pattern; I had fewer stitches than even the smallest size. Luckily, a gathered neckline is extremely forgiving, so I just followed the instructions for the eyelets on the neckline and bound off. Even with these modifications, though, it slips off my shoulders a bit and requires frequent cinching of the ribbon. I don't have much to say about the yarn: it's fine. It's drapey enough for the pattern, but seems to be holding the ribbing so far. I was hoping for more of a kelly green, and ended up with exactly a match to my grass. Such are the perils of buying yarn online. In all, a satisfying knit and a cute, wearable summer top. 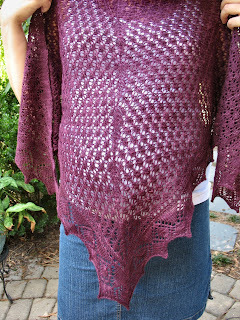 A few months ago, my very good friend Melissa, a doula, asked me to donate a shawl for a charity auction. I said yes, first because it was Melissa, also because I had the time, but most importantly because the auction supports a wonderful organization: Birth Matters Virginia. I believe every birth to be a celebration and every mother a goddess no matter how a baby enters the world -- by cesarean or vaginally, with or without drugs, in a hospital or at home. Birth Matters Virginia is working to create a more supportive culture for pre-natal care, birth, and post-partum care. 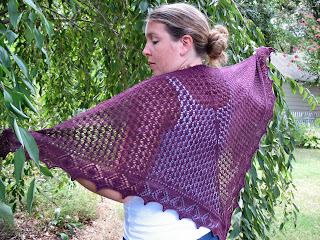 And now, here is the shawl -- modeled by the beautiful and stunning Kindness Girl. Doesn't she rock pregnancy? Notes: Although I was quite intimidated at the beginning of this (CO 375 sts - eek! ), once I passed the border it was quite enjoyable. Since I've been a lazy knitter this summer (Fran and Katherine can attest to the fact that I didn't knit much even at Knit Night! ), I did have to push it into high gear for the past 4 days to get it done on time. This yarn is fabulous. I bought it at The Fiber Festival in Montpelier and I will buy more this year. It is soft, light and the kettle dyed color is incredible. Here is a link to their website - I was able to load the page last week but seem to be having a bit of trouble today. Many thanks to Kindness Girl for the modeling! PS And thank you Fran for the canning information -- I'm going to try to pickle some cukes this weekend! As you can see, I am still embracing my summer laziness in the posting. I have a couple of almost-FOs to show, and I will make a concentrated effort to sew buttons, weave in ends, photograph and post in the next week or so. I didn't, however, want to let the week go by without posting something about Jody's new venture, Knotions Magazine. The patterns (Oak Leaf Socks are gorgeous!) are lovely, and Jody writes clear, incredibly helpful technical articles to really help tweak your knitting. I have long considered her a Certified Knitting Genius, and am lucky to call her a Friend as well. She has worked long and hard on this new project of hers, and it is clear she has put a lot of thought into making Knotions a magazine knitters will love, including a wide range of sizes, clear charts and schematics, etc). I know it has been out for a few days, but I just wanted to alert all three of you out there still reading to go check it out if you haven't yet. My sister is not a knitter (yet), but she loves the Phils. And knitters. Well, me, at least. This week was Stitch and Pitch at Citizens Bank Park. This summer has brought Phillies mania to my household. I've been a casual Phillies fan my whole life, but this year, I have been converted to True Believer status. My son is an absolute fanatic, waking up every morning to check box scores, and making passionate running commentary on the games. Mr S has also embraced the Phils, the first time he has chosen Philadelphia team as his own. The Montco Sit and Knit group has quite a few lifelong Phils fans, and so it was quite a pleasure to be among my people: knitters AND baseball fans.